If evangelicals are the ones who insist most aggressively that they believe in sola scriptura, and if evangelicals are the ones who assert most vigorously the transforming work of Jesus Christ, then it is reasonable to hope that what the Scriptures teach about the origin of creation in Christ, the sustaining of all things in Christ, and the dignity of all creation in Christ—about, in other words, the subjects of learning—will be a spur for evangelicals to a deeper and richer intellectual life: “He is before all things, and in him all things hold together” (Colossians 1:15-17). For evangelicals (as for other Christians) the greatest hope for learning in any age lies not primarily in heightened activity, nor in better funding, nor in sounder strategizing—though all of these exertions have an important role to play. Rather, the great hope for Christian learning lies in the Christian faith itself, which in the end means in Jesus Christ. Thus, if evangelicals are the people of the gospel we claim to be, our intellectual rescue is close at hand. But how will evangelicals pursue goals defined by phrases like “first-rate Christian scholarship” or “the Christian use of the mind,” when these phrases sound like a call to backsliding for some in the churches and like a simple oxymoron for many in the broader world? For a Christian in the evangelical tradition, the only enduring answer must come from considering Jesus Christ as sustaining the world and all that is in it. In the light of Christ, we can undertake a whole-hearted, unabashed, and unembarrassed effort to understand this world. In a mind fixed on him, there is intrinsic hope for the development of intellectual seriousness, intellectual integrity, and intellectual gravity. 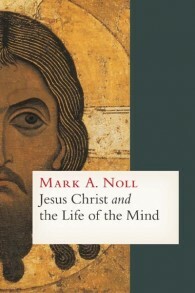 In 2011, Dr. Noll expanded this theme into a book-length treatment of the life of the mind as grounded in the work of Christ, the creator and sustainer of all of creation. [I]f what we claim about Jesus Christ is true, then evangelicals should be among the most active, most serious, and the most open-minded advocates of general human learning. Evangelical hesitation about scholarship in general or about pursuing learning wholeheartedly is, in other words, antithetical to the Christ-centered basis of the evangelical faith. There is no sphere of existence over which Jesus is not sovereign, in virtue of his role both in creation (1:16-17) and in reconciliation (1:18-20). There can be no dualistic division between some areas which he rules and others which he does not. “There is no neutral ground in the universe: every square inch, every split second, is claimed by God and counterclaimed by Satan.” The task of evangelism is therefore best understood as the proclamation that Jesus is already Lord, that in him God’s new creation has broken into history, and that all people are therefore summoned to submit to him in love, worship, and obedience. The logic of this message requires that those who announce it should be seeking to bring Christ’s Lordship to bear on every area of human and worldly existence. Jesus Christ and the Life of the Mind is not a book just for those working in the academy. Its message is critical for all of us who seek to become mature in Christ in all areas of our lives. Noll’s last chapter, “The Way Ahead,” provides a fitting caution against the danger of intellectualism as a remedy for the anti-intellectualism that he discussed in The Scandal of the Evangelical Mind. Believing scholars like myself who think that we have identified cultural or historical circumstances that impede responsible intellectual work can easily fall prey to a besetting temptation. The temptation is to think that if we have upbraided Christian communities for their anti-intellectual Gnosticism, or if we have chastised the general academy for paying too little attention to Christian insights, we have somehow accomplished a great deal. In fact, even at their best, such criticisms or challenges are only like an official at a track meet calling the competitors to the starting line. Running the race is different. The race itself requires what the author of Hebrews calls throwing off hindrances and running with perseverance. But most of all it requires keeping the prize in view: “Let us fix our eyes on Jesus, the author and perfecter of our faith, who for the joy set before him endured the cross, scorning its shame, and sat down at the right hand of the throne of God.” For Christian life, including Christian academic life, to press on without growing weary and not losing heart, the scriptural injunction is simply to “consider him” (Heb. 12:2-3). And so for scholarship that is Christian the essential ingredients are the same as for family life, politics, community service, economic activity, medical care, or any other activity that would be Christian. Those ingredients are prayer that returns to the source of forgiveness and hope, service that goes into the world in Christ’s name, Bible reading or preaching or catechesis that rehearses the story of salvation, sacraments that instantiate the presence of Christ, fellowship that draws believers to each other and to their lord, singing that inspires love of God and neighbor, sympathy that turns hearts toward the suffering, and meditation that draws the mind to God. Mark A. Noll is Francis A. McAnaney Professor of History at the University of Notre Dame. In addition to The Scandal of the Evangelical Mind, Dr. Noll is the author of Turning Points: Decisive Moments in the History of Christianity, A History of Christianity in the United States and Canada, and The Rise of Evangelicalism: The Age of Edwards, Whitefield and the Wesleys (A History of Evangelicalism). A revised version of “The Evangelical Mind Today” is provided as a postscript in Jesus Christ and the Life of the Mind.